Cities Connection Project | ‘DU-BOIS-MELLY’ BUILDING. GENEVA. 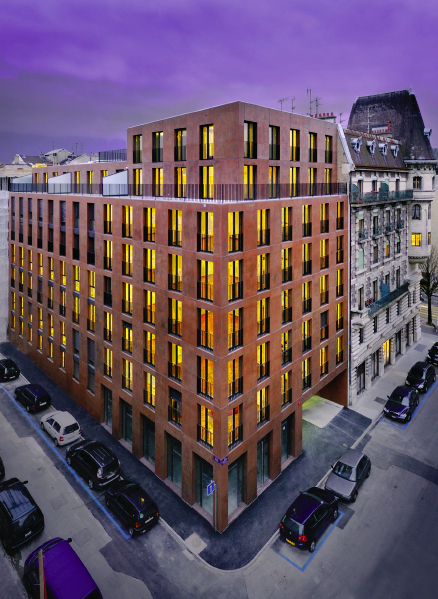 The building is located in the Plainpalais quarter of Geneva within a tissue of typical 19th century buildings that are grouped in blocks around narrow interior courtyards. The new building is situated on the corner of one of these building blocks and replaces a dilapidated wooden residence and workshop. The project proposes, despite its intentionally contempory language, to complete the circle of this 19th Century block with a building that respects the different alignments and volumes of its neighbors. One of the neighboring buildings has one more floor than the other buildings on the block. The transition between different heights is achieved, in the new building, by the creation of two volumes by which the principle lower volume aligns with the cornices of the adjacent buildings while the upper body plays with different volumes to align with the height of the neighboring building. The facades are built with pre-cast concrete elements that reflect the mineral character of the adjacent historical buildings. The originality is that these facades offer a warm rust-stipled effect that was achieved by sprinkling an orange oxide on the surfaces of the anthracite pre- cast concrete elements. The courtyard side facades are composed of alternating prefabricated elements and a lighter coloured render that brightens the courtyard. 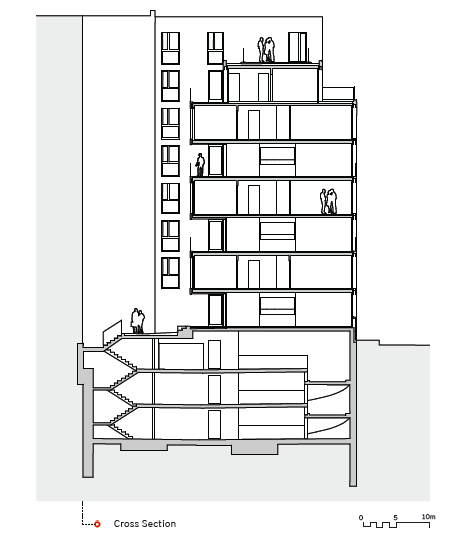 Fort he project organisation, the 26 appartments are accessed using a central staircase and lift situated at the junction of the two wings of the building. The building has well defined typologies. The corner volume of the building is comprised of single story appartments while the rest of the building is composed of duplexes accessed by open landings on the courtyard side. These wide landings act as sun-lit extensions of the appartments and can serve as balconies and terraces that enliven the courtyard.